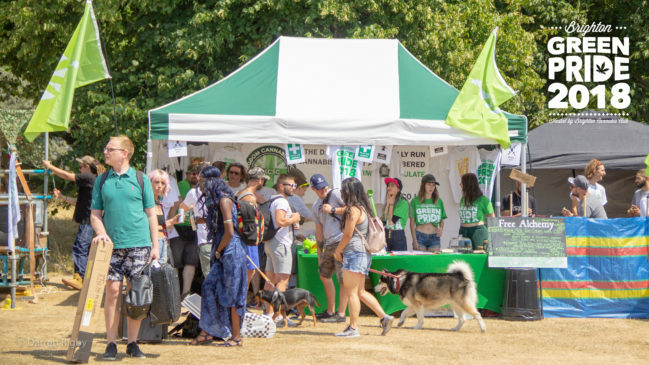 In the longest summer on record since 1976, organisers of Green Pride started arriving at Brighton’s Preston Park as early as 7am on Sunday 21 July to prepare the field for a day of herbal protest against the current and wavering drug laws in Britain. 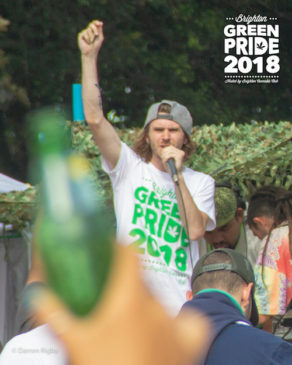 Brighton Cannabis Club have been instrumental in helping shape the cannabis social club scene in the UK and this year’s protestivities lived up to expectation. 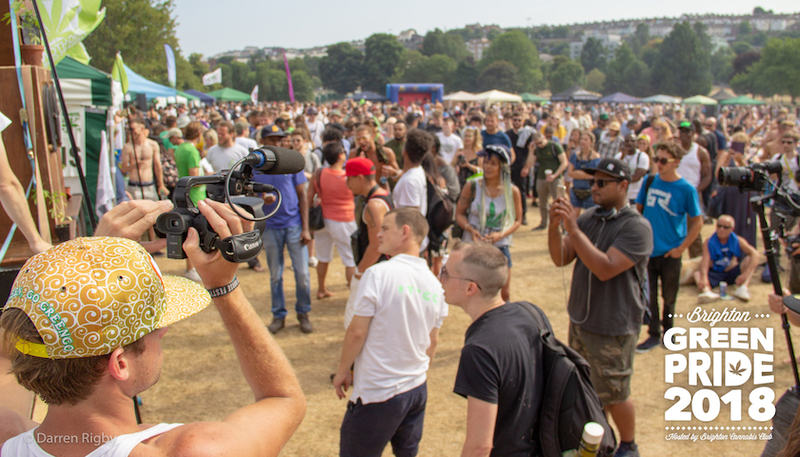 The grass was golden, dry from the heat and lack of usual flow of rain that comes off of the South Downs but it was only 9am before excited, dedicated cannabis enthusiasts and activists started arriving asking what they could do to help the Brighton day crew. These of course were familiar faces that have been pushing the cannabis mission in their own respective areas for many years, just trying to do their part for the day. 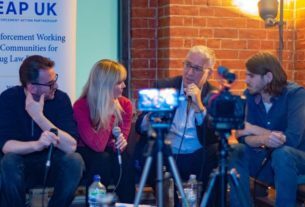 The community spirit has increased in recent months with so much media traction and it was nice to see people pouring the energy they have encapsulated from that back into an event that means so much to the cause. 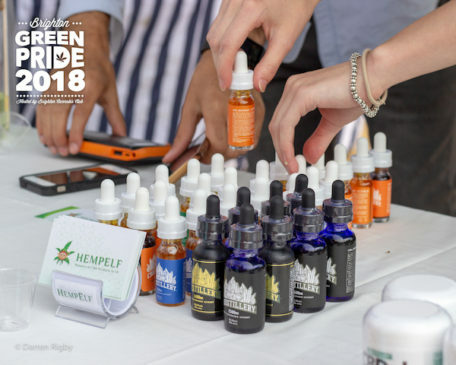 Vendors were arriving assembling their marquees and gazebos, dressing their booths with their products in preparation for an estimated 5,000 attendees. People from hampshire, Cardiff, Dumfries, Hitchin, Peterborough and ever further made the journey down to support the cause of the day, spreading cannabis awareness and greeting people that looked like they needed someone to chat to about the wider understanding of cannabis. 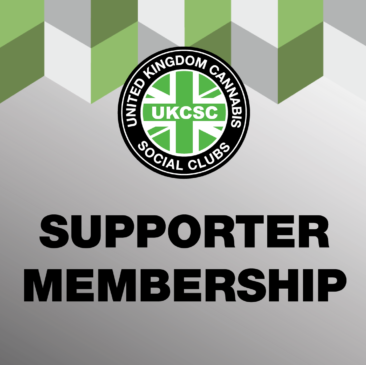 The first point of contact role that the clubs have come to play in society today is something to proud of; not only are they putting themselves out there as cannabis users but they are making sure others have a better understanding and eventual experience with the herb for medical or recreational use; if some harm can be prevented a good day has been had. All was not rosey though as police set about their mission for the day to act out their civil duty of harassing peaceful cannabis consumers sitting in the park, minding their own business. Watching the yellow bibbed police officers march through the park as if they had a target across the field to a specific person or group of people, walking past dozens of people doing exactly the same thing highlighted the hypocrisy of the day. “It’s an uncomfortable feeling” said one attendee to us, “we just want to be able to skin up but it feels like they are going to pounce”. Meanwhile, others skinned up freely but remained discreet and put their joints down as the officers skulked through the park looking for oblivious targets. By 3.30pm the arena setting that had been created by a ring of vendors was packing out and a hazy atmosphere was starting to fill the space. Tyler Green from iSmoke Magazine was bouncing around the booths soaking up the enjoyment of the day looking like he was having a thoroughly good time. With his Borofest-purchased Mellow Glass oil rig in the Private Members area backstage at Green Pride we managed to catch a few moments with him: “It’s amazing what they have done, BCC should be proud of themselves,” he said. Speaking to Greg after he came off stage he said: “The turnout today is phenomenal and it only goes to show what desire there is for change in the UK. “The medical debate has been raging on and people feel like there is a bit of magic in their air and they want to make something of that in their own parts of the country. Speaking with several officers on the day we learned that a number of the arrests were for underage participation or dealing of class A substances. While we do not believe that a criminal record is the right way to deal with someone we understand the policie’s desire to keep people safe. 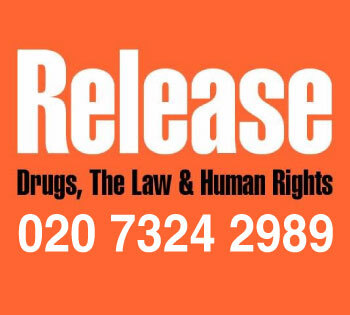 Green Pride is a cannabis protest, the fact that so many people do get away with the civil disobedient act of smoking a bit of weed in public, it clearly isn’t an excuse or valid opportunity to come and sling MDMA pills. We just hope any underage people that came didn’t leave with a criminal record – if you did, get in touch as we’d like to help. It’s hard to put a exact number on how many people came in all throughout the day but it seems like it was at least double of last year, which was around 3,500. We would say there were between 4,000-5,000 in all but maximum capacity probably reached last year’s total. Needless to say there was plenty of high quality herbs around as we were shown a number of UK cup winning growers Devcal, Stoned Circle and Roadrunner’s strain selections that really gave us an enjoyable edge to the day, christening a new flower piece picked up from our recent visit to RAD supplies over in Swansea. Brighton Cannabis Club stayed pretty late cleaning up Preston Park with a dozen strong crew picking up litter with grabby sticks. 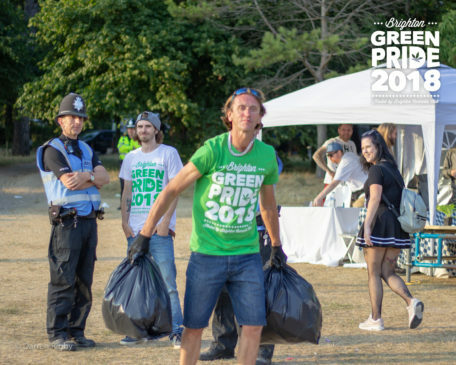 Over 70 bin bags were filled and this was well documented by UK Cannabis Social Club photographer Darren Rigby. Dom turns Brighton local resident took a stroll to the park in the morning to check up on the rubbish that had been covered in three tarpaulins bought especially for the purpose. To his dismay he had seen that several bags had been removed and purposefully spread across the field seemingly in an attempt to give Green Pride a bad name. To then see the local paper, The Argus, trying to shame the event was a low blow and we have photographic evidence of the condition we left the park in after a proud team spent several hours making sure it was spotless other than the covered pile of bin bags. It seems a real drag to keep going over this issue… so maybe we need to get to the real point. 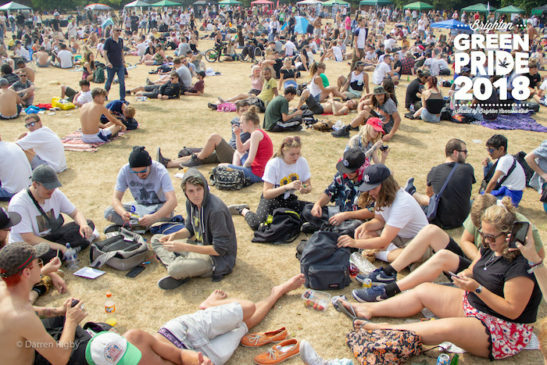 Give us legal cannabis social clubs and we don’t need to do protests in the park… it’s really that simple. Green Pride is an example of people power, it’s a show of disdain for the current drug laws, a show of the size of the potential market and a show of the distance people are willing to travel to connect with cannabis smokers like themselves. Well, here’s news for some – there’s a tribe like this in every town, you just need to create the situation to connect with them. 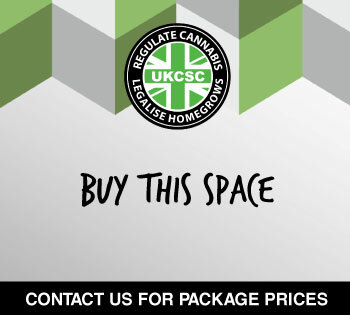 Brighton Cannabis Club before it was even really a club did this five years ago in a the back of a pub by putting out the word that they wanted to make it happen. 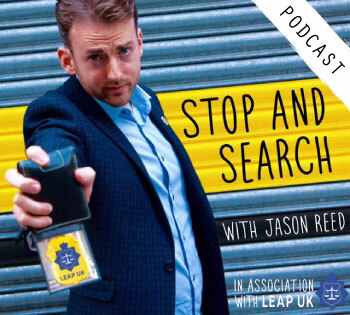 Well… now it’s happening, and if you’re local enough to become part of it, become a member. If you’re over an hour away or think your town needs someone like you, check out this page, work out who your closest allies are and start something. Britain needs to be greener.